The carcass of a 7-year-old tiger was found in Bandhavgarh tiger reserve on Friday afternoon, taking the striped cat’s mortality in Madhya Pradesh to 25 this year. KP Bangar, in-charge field director Bandhavgarh Tiger reserve told HT on phone that the carcass was found in Panpatha area of the buffer zone by a forest patrol around 3 pm on Friday. The big cat had died at least two to three days ago. “There are no injury marks or missing body parts. It is a mystery how a tiger in the prime of his life died like this. I have asked the officials concerned to take samples of the kills in the nearby areas to check the possibility of poisoning,” he said. Bangar said the carcass would be cremated on Saturday morning. “Sniffer dogs will also arrive in the morning. So we have not disturbed the carcass from its position. We have fenced it. The exact cause of its death will be clear by Saturday evening when the postmortem result will come,” he said. This is the fifth tiger death in Bandhavgarh and 25th in the state this year. Three tiger reserves -Kanha, Pench and Bandhavgarh - are witnessing tiger mortality of an unprecedented scale. The majority of tiger deaths -19 out of 25- are from Pench and Kanha tiger reserve. In Pench, ten tigers died since January 1, while nine have died in Kanha so far this year. It is also the fourth tiger death in Madhya Pradesh in just over a month. On September 29, a one-year-old tigress died in Pench tiger reserve’s buffer area due to starvation. The tigress had died due to poor hunting skills. Then on October 22, the carcass of another 6 to 8-year-old tiger was found in Khatiya range of Kanha tiger reserve, with all its four paws chopped off. The tiger had died due to electrocution. On October 28, the carcass of another tiger was found in Kanha. 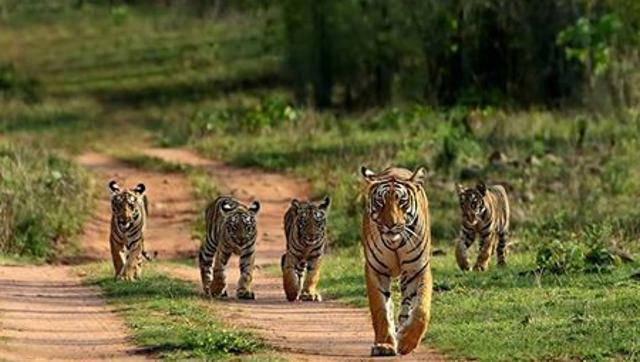 Bandhavgarh tiger reserve, located between the Vindhya and Satpura ranges in Umaria district, has one of the highest tiger densities in the country, with 61 adult tigers and 12 sub-adults. Due to this, the reserve has been witnessing incidents of man-animal conflict in last few years, with both man and tiger getting killed.